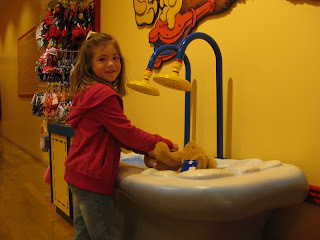 Last September, Lillian received a gift card to Build A Bear from Uncle Faron, Aunt Chrisie, and Cole. We were so busy last fall that we never had time to use it. 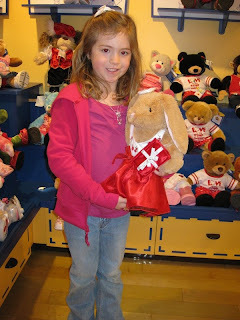 Finally, I made time last Saturday to have a girls morning at the mall to "build a bear." Lillian had so much fun and claimed it was the best morning ever! I know opening a gift card isn't much fun but getting to do the activity attached to it sure was! I know from first-hand experience that Rosie is a much-loved Rabbit. She is so cute! I had no idea she was only 1 day old-Lillian did a fantastic job of sharing Sunday AM. I love how well the girls play nowadays. PS-I hope Grace did a poor job of sharing, as she came down with strep throat today. I'm not sure if you want to disinfect Rosie, but you might spray her down or something I'm so sorry. Oh, Lillian told me all about Rosie on Saturday when she was at the house. I hated giving her a giftcard for her birthday but I wanted her to be able to pick everthing out herself. I am so glad she had a good time doing it. How fun! I bet she will always remember doing that with you.